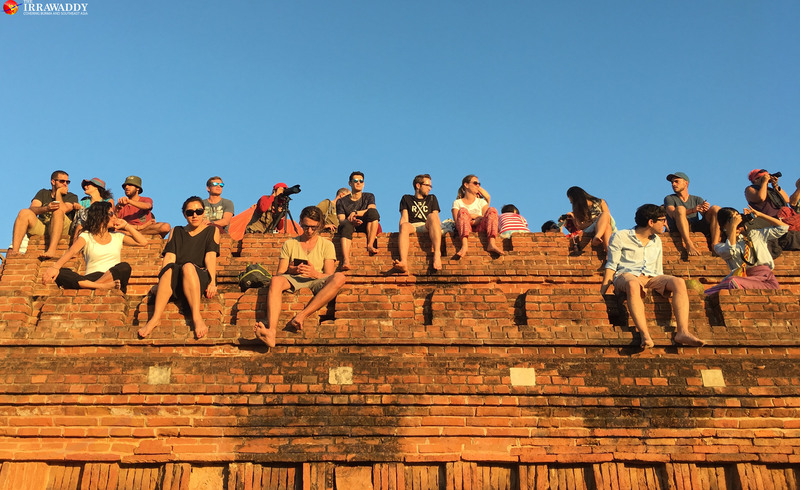 RANGOON — A possible ban on temple climbing in Burma’s ancient capital Bagan is rumored as State Counselor Daw Aung San Suu Kyi denounced the controversial activity at the tourist hot spot during her visit this week, suggesting that alternative viewing platforms be built. She called for the ban to protect cultural heritage in Bagan on a visit to the area with the Royal Queen Mother of Bhutan Ashi Dorji Wangmo Wangchuck. “Viewing sunset and sunrise from the temples can cause damage to the cultural heritage,” the State Counselor commented on Tuesday while visiting the earthquake-affected ancient temples in Bagan. “[It] is not suitable in the long run and should be banned in the future,” she added. Bagan houses stupas, temples and other Buddhist religious buildings constructed from the 9th to 11th centuries—a period in which some 50 Buddhist kings ruled the Bagan Dynasty. There are more than 3,000 stupas and temples in the area. Of these, 120 temples have stucco paintings and 460 have mural paintings that are found to be in need of preservation. Temple climbing is regularly cited as a “must-do” for tourists and local visitors to be able to enjoy the ancient capital’s famed sunrises and sunsets. An attempt by the Ministry of Religious Affairs and Culture last year to prohibit visitors from climbing the steps of stupas and temples in Bagan was met with criticism by the tourism industry, after which temple climbing was allowed at five famous temples— Pyathatgyi, Shwesandaw, South Guni, North Guni and Thitsar Wadi. The ministry also slammed temple-climbing tourists’ “inappropriate clothing” as “culturally disgraceful” in an official statement banning the activity. A powerful 6.8-magnitude earthquake struck central Burma in August last year damaging more than 400 pagodas in the ancient capital, affecting the strength of the temples and causing the ministry to further restrict climbing on all temples except Pyathatgyi, Shwesandaw, and South Guni. U Aung Aung Kyaw, a director in Bagan’s Archaeology Department, told The Irrawaddy on Wednesday that the very first alternative viewing platform near Sulamuni temple has yet to be completed and the ban would take effect during the next tourism season—from late October until June, after more platforms were built. “[Temple climbing] is not appropriate from both religious and cultural perspectives,” he said. However, Bagan resident U Zaw Weik said a total ban on temple climbing would not be an appropriate solution. He suggested that limiting the number of temple-climbers and visiting hours at the crowded temples would be a better approach. “It should be balanced between a total ban and a huge crowd of temple-climbers every day,” he said. Regarding alternative viewing platforms, U Aung Aung Kyaw said the structures would be five meters tall and sympathetic to the surrounding landscape of the ancient city. However, U Zaw Weik said locations for the platforms were controversial as there are plans to build them on an ancient water reservoir and archaeological experts and UNESCO have been skeptical about the plan. UNESCO’s national project officer Ma Ohnmar Myo told The Irrawaddy that the organization would not object to the plan if the platforms would decrease the impact on the heritage value of the temples and not cause damage to the original landscape. The water reservoir could have heritage value as well, but thorough research is needed to prove this, she added. During her visit to Bagan, Daw Aung San Suu Kyi urged transparency in the conservation and repair of the ancient structures affected by the quake. She also highlighted the importance of public consultation in establishing a zoning system in Bagan. She said that in order for the public to accept the new zoning, the process should be conducted deliberately and with complete transparency. Burma plans to nominate the Bagan Archaeological Zone for UNESCO’s list of culturally significant sites this year for reconsideration in 2018. Bagan’s first attempt came in 1996, but it was rejected due to poor conservation management plans and legal framework. UNESCO’s Ma Ohnmar Myo noted that the country’s approach for conserving the city has been on the right track.